Much of society simply writes them off. Politicians may see them as just another statistic. Often the family that should care simply doesn’t. But Gail Bigler cares. West Court Street Church of God in Flint, Michigan, cares. They recognize that, without an intersection between faith and community, the future for many children is bleak. But at Intersection, an after-school ministry of West Court Street Church of God, caring volunteers take a step in the right direction toward addressing a prevalent need. hang out, have fun, learn, and be loved. Eleven volunteer staff facilitate the ministry program, though only about seven are required to run the program each week. 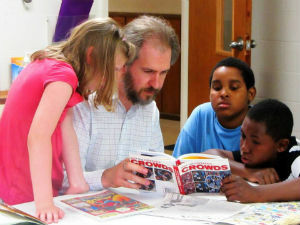 The volunteers help kids with their homework, though many don’t reliably bring it with them. But always at-the-ready are books, math games, music, science activities, crafts, and more. Eight computer stations are set up and prescreened for safe and fun learning. Dinner is also provided, thanks to a cooperative arrangement with the Food Bank of Eastern Michigan. But the motivation for a new outreach program didn’t stop there. The church was all too familiar with the grim statistics that communicated far-less-than-ideal prospects for the local children. So after a merger of the kids and youth ministries into one family-style program, the church got together to recruit willing servants. The ideal candidates would have a heartfelt desire to sustain a ministry to neighborhood children, provide a safe after-school alternative, and help determine how the church could make a long-term, future-altering impact on the kids. “Intersection was birthed by committed individuals who were not satisfied to ignore the children in our neighborhood,” Gail reflects. Many students rely on free lunch assistance throughout the school year, but are left high and dry during the summer. So during the summer, West Court Street Church of God meets another practical need for area children. The church, as an extension of Intersection, has stepped in to fill that void. By partnering with the food bank, the church offers a fresh lunch every weekday through the summer months. 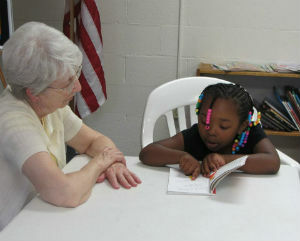 Last summer, one of the church’s small groups purchased age-appropriate Bibles for the children of Intersection. Many of the children get excited to report how much they’ve read each week. In this kind of spiritual climate, it has become clear that Jesus is the subject. At Intersection, the truth of Jesus is shared through God’s Word, and the love of Jesus is lived out in action. Learn how the Church of God is making Jesus the subject at www.JesusIsTheSubject.org. This entry was posted in All Church of God, Great Lakes and tagged after school, children, community, Flint, Gail Bigler, kids, Michigan, ministry, outreach, West Court Street Church of God. Bookmark the permalink.